People love to feel important. As if they matter. Exclusive, even. It’s one of the primary drivers for the success of social media but often times, it’s difficult to stand out among the crowd. Web developer Justin Foley recently came up with a simple yet seemingly effective way to give people an ego boost. 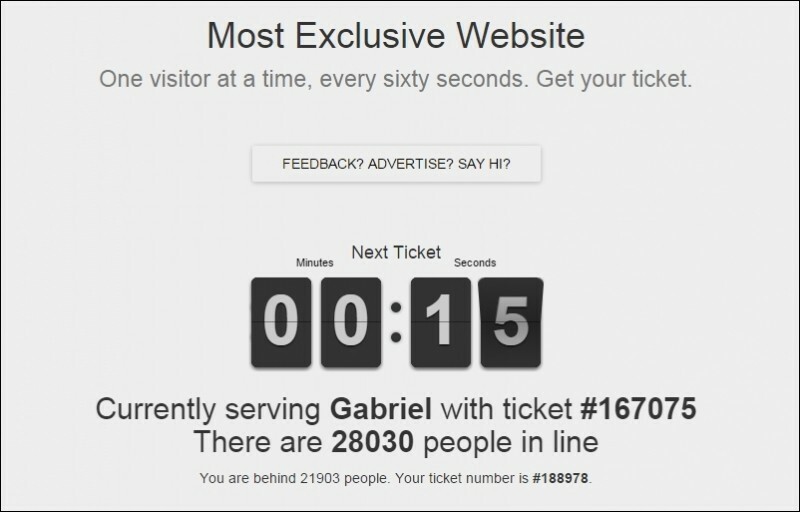 His website, MostExclusiveWebsite.com, allows just one visitor in at a time. To gain access, interested parties must take a ticket and wait in line for their turn. A new visitor is let in every minute and once in, you have just 60 seconds to check out whatever it is that lies inside. If you close the browser window or navigate away, you’ll lose your spot. The concept is similar to the I Am Rich app from several years ago except this is free. Foley told The Washington Post that he initially launched the site in March to test out a new programming framework he’d recently learned. The site didn’t get much attention until it was featured on Johnny Lists, a blog comprised of (almost) daily lists to make life easier (similar to the Life Pro Tips subreddit). For those wondering, the site was ranked first in a list of the top 10 completely useless websites. Runners-up include purple.com and toiletpaper.com which lets you play with a roll of virtual toilet paper. Foley wouldn’t reveal what’s waiting for those that do get in although it’s not too hard to find (check YouTube if you want a spoiler).